You'll be £25.00 closer to your next £10.00 credit when you purchase A Tale of Ten Spitfires. What's this? Order within the next 2 hours, 22 minutes to get your order processed the next working day! The Fw190’s supremacy over the Spitfire V is a classic legend from the Second World War, heralding one of the darkest times for Fighter Command and the RAF. 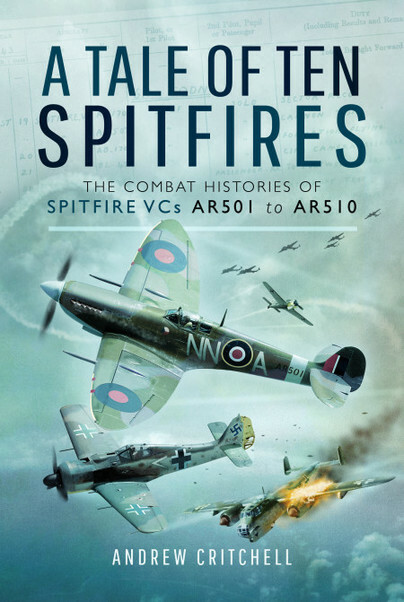 A Tale of Ten Spitfires brings this legend to life by examining the individual combat histories of ten Spitfire VCs, the first of which is the Shuttleworth Collection’s well known Spitfire AR501, followed by the next nine on the production line, AR502 to AR510. This link to a ‘living’ airframe, which has recently flown again after an epic 13 year restoration, will appeal to both enthusiasts of AR501 and anyone with a wider in interest in this classic British icon. Through first hand accounts, combat reports, unit diaries and more, the book provides a unique looking glass into the period, told via the experiences of the Spitfire pilots themselves, tracing their fates and those of the ten machines that they flew. The stories of these iconic aircraft are told via fascinating first hand accounts, combat reports, unit diaries and other official documents. This is a very interesting and unusual book that, rather than describing an aircraft type, its development or operational use, looks at a number of individual airframes. Obviously the result of a considerable amount of research, A Tale of Ten Spitfires provides an interesting insight in to the air war of 1942-44. Can confirm my original impression--it's an outstanding concept (unique as far as I know) and a great, easy read for WWII aviation enthusiasts. An enormous amount of research was required, and a good result was obtained.